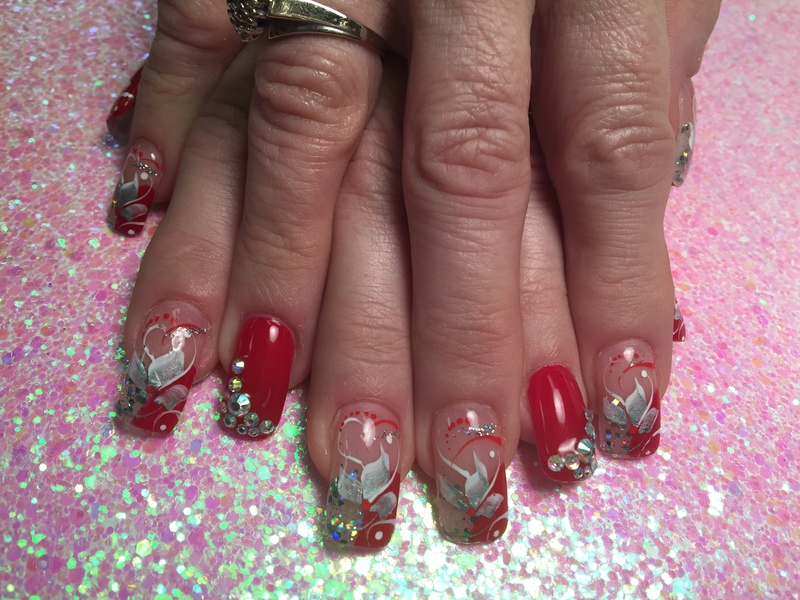 Stiletto Shoe Tips, nail art designs by Top Nails, Clarksville TN. Choice: Shiny light pink tip/flesh nail/diamond glue-ons, OR translucent nail, shiny black vertical lines, pink bowtie, diamond glue-on, OR translucent nail, thin black-lined tip, raised pink flower glue-ons, OR Shiny bright pink nail with diamond glue-ons. 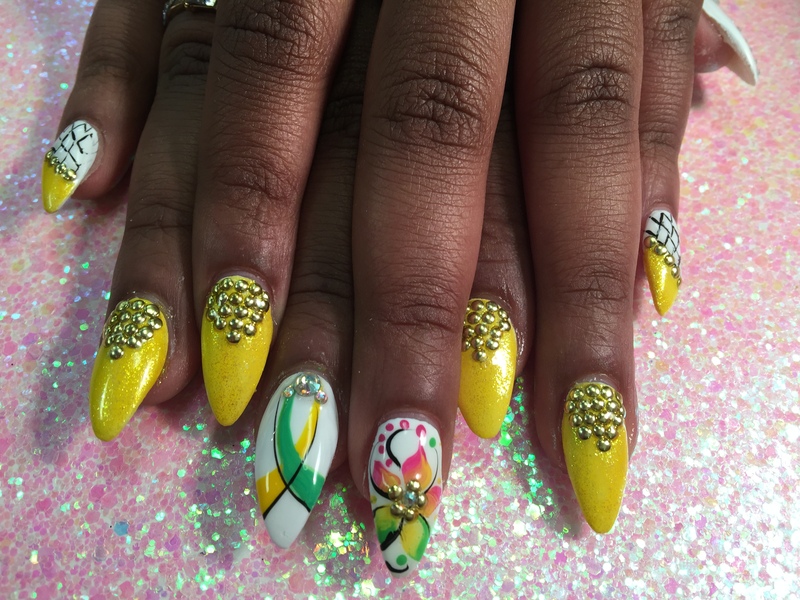 Jamaican Vacation, nail art designs by Top Nails, Clarksville TN. 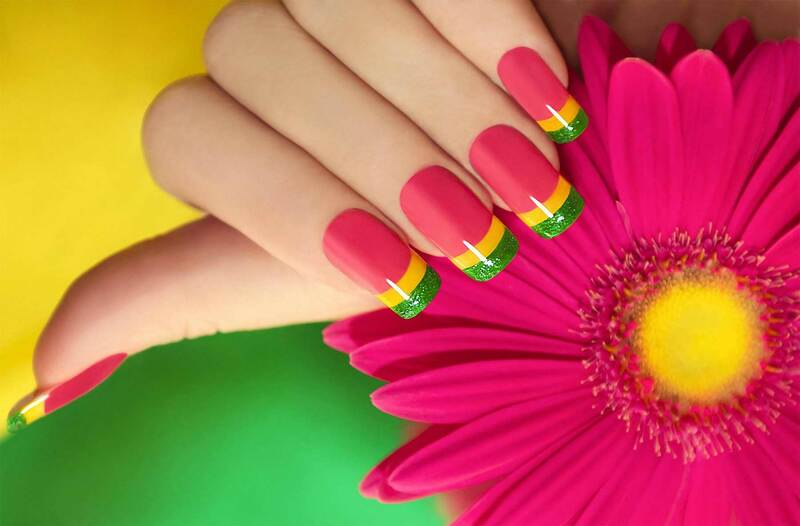 Choice: Point-tipped shiny sparkly banana yellow nail with gold bead glue-ons at cuticle OR opaque brilliant white nail w/pink/orange/green/yellow stargazer lily, gold glue-on center, black swirls, pink/green dots OR green/yellow/black swirl design w/diamond glue-ons. Peruvian Gold, nail art designs by Top Nails, Clarksville TN. Choice: Translucent white nail with gold sparkles OR Angled half-curved lavender/half-curved translucent gold sparkled tip w/green/white swishes, white/green swirls, white dots, sparkles. My Valentine’s Day Gift, nail art designs by Top Nails, Clarksville TN. 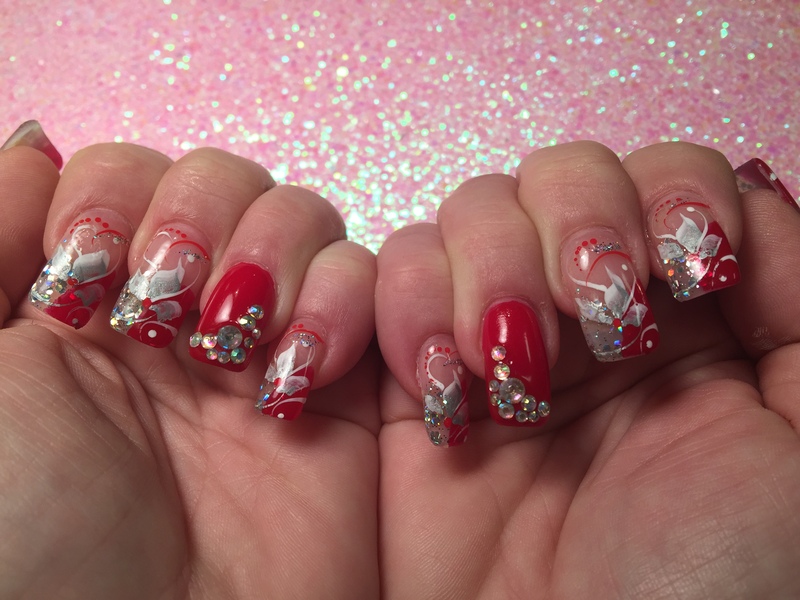 Choice: Shiny brilliant red nail w/diamond glue-ons, OR half-curved brilliant red/half-curved sparkly translucent white tip w/silver/white swishes, mirrored glue-ons, white/red/sparkly swirls, red/white dots. 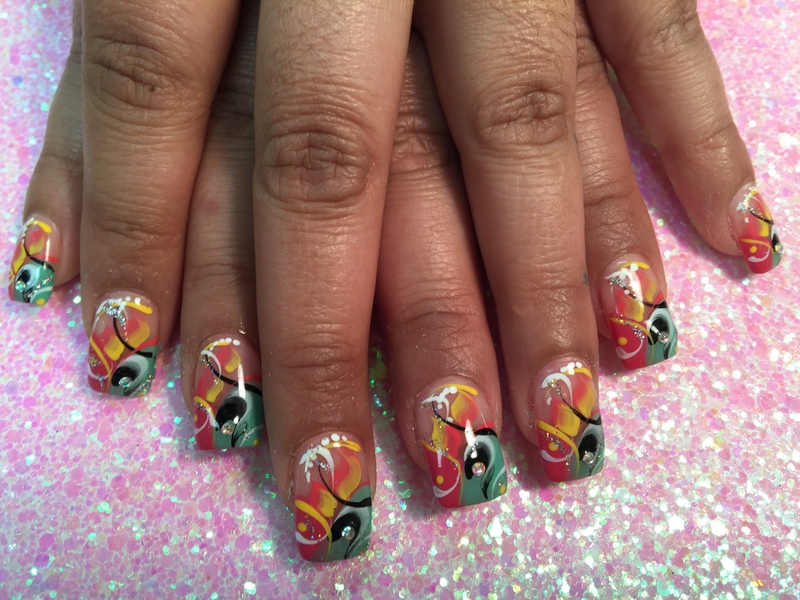 Hawaiian Sunset, nail art designs by Top Nails, Clarksville TN. 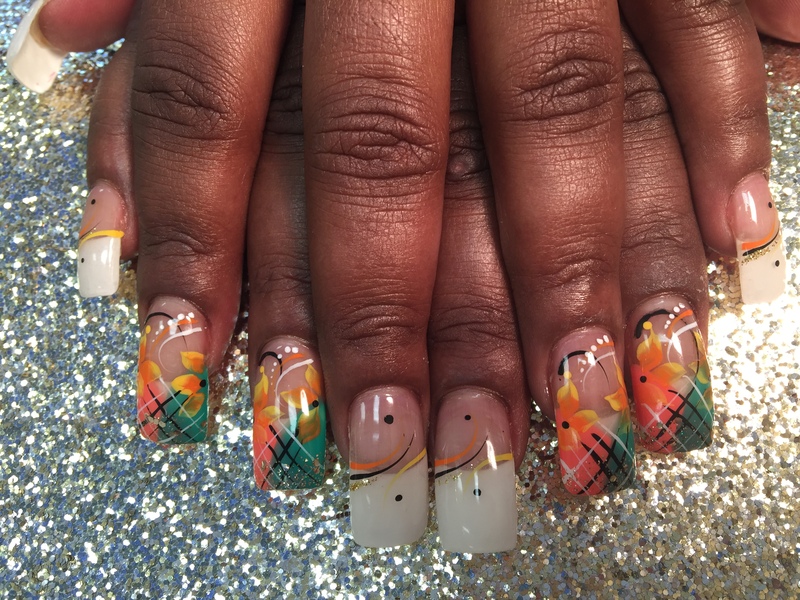 Choice: Translucent white tip w/yellow/black/orange swirls, black dots OR half-curved aqua/half-curved peach tip w/angled hashed black/white lines, orange/yellow lilies, white/orange/black swirls, white/black dots. 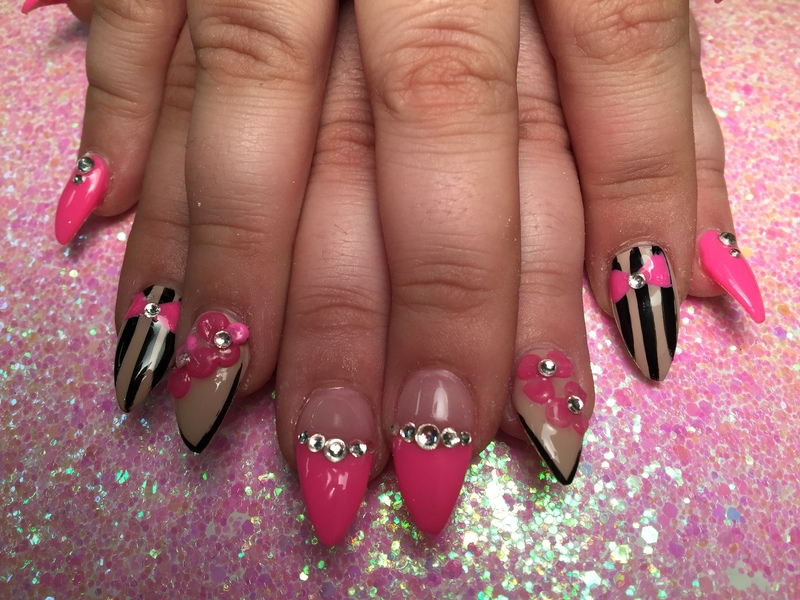 Love Pink Tiger, nail art designs by Top Nails, Clarksville TN. 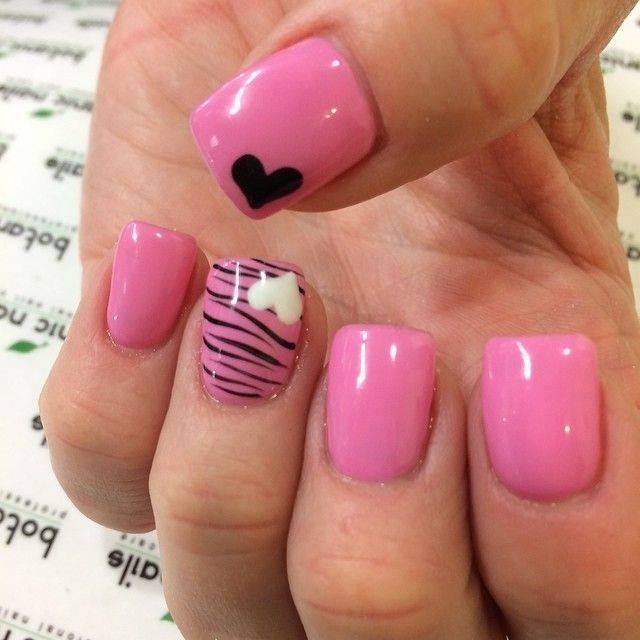 Shiny Light pink nail with optional black or white heart in corner and black tiger stripes. 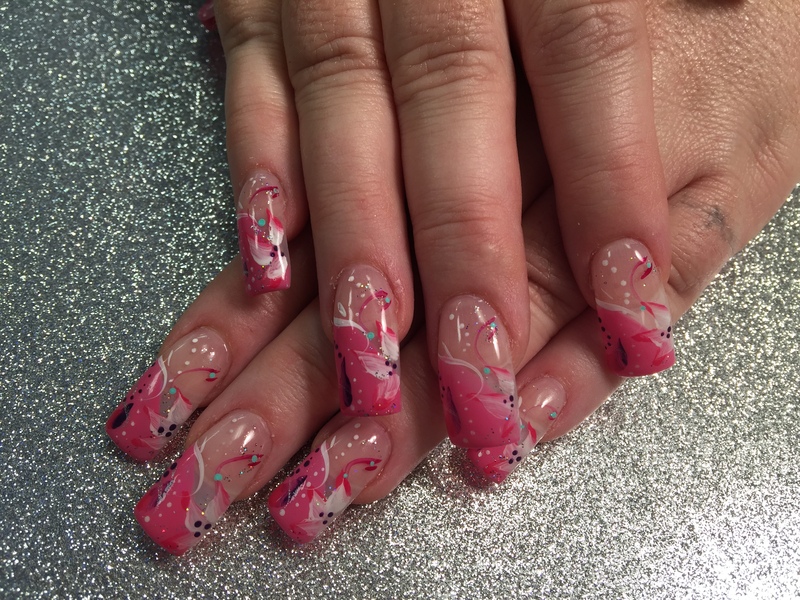 Sparkling Stargazer Swirls, nail art designs by Top Nails, Clarksville TN. Choice: Half-sparkly silver/half-opaque white tip curved to cuticle, topped w/flesh colored nail, w/optional sparkly/silver stargazer on side, diamond glue-on. Paris Rain, nail art designs by Top Nails, Clarksville TN. Angled light pink tip, white/pink lily petals, white/pink swirls, white/black/aqua dots, sparkles. 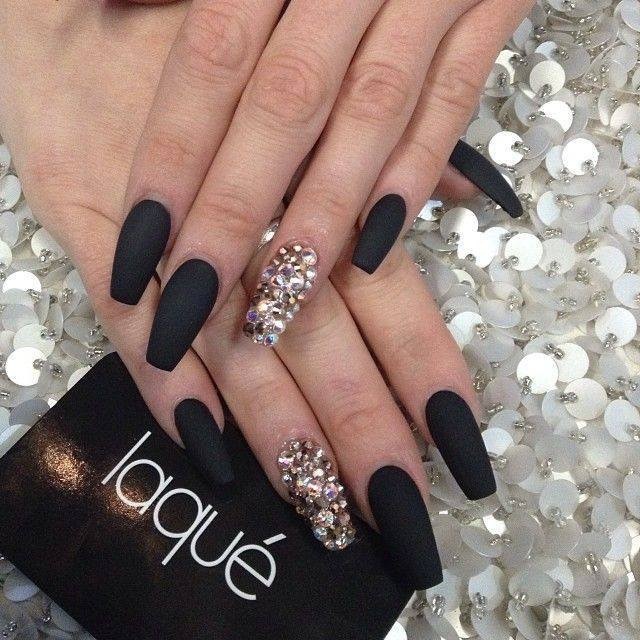 Chic Diamonds and Black, nail art designs by Top Nails, Clarksville TN.